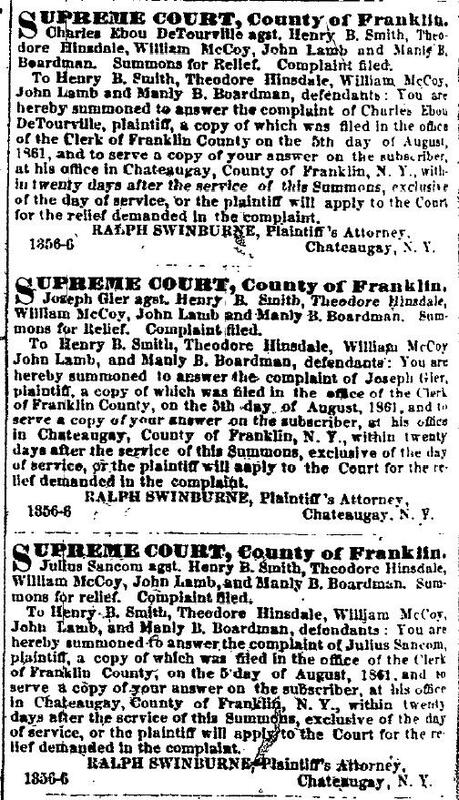 Aren’t people who were born, got married or died between 1880 and 1900 the most difficult to search? You’re going to tell me that it depends on where they lived (some States are more secretive than others) or whether other sources are available. Exactly! Take for instance Charles B. Tourville, born on May 20, 1857 in St. Louis, Missouri to Joseph Toussaint Tourville and Susan Stout. That date came from the Pension Application of his father, a Civil War veteran. For the rest, I had to rely on the 1860, 1870, 1900 and 1910 US Census. What have I learned from those census? In 1860, the family lived in St. Louis, Missouri. By 1870, they had moved to Canton, Fulton County, Illinois. Although Charles’ parents and youngest siblings are back in St. Louis by 1880, he’s nowhere to be found. The next hint I got was from the 1900 US Census. Charles is living in St. Louis and he is married to Katherine. Looking more closely at the household I noticed that the wife never had any children, the couple had been married for four years, a daughter of Charles is living with them, Lorena, born in September 1885. And finally, the 1910 US Census tells us that the couple is living alone, with new details: it was a second marriage for him and a first for Katherine. I quickly discovered a marriage license dated September 17, 1896 for Charles Tourville and Katherine F. Motzer on Ancestry in the “Missouri Marriage Records” database. I found no other marriages for Charles. See how newspapers filled that 1880-1900 gap? Not only did I have Amelia’s maiden name but also her age and the cause of death. With that information in hand, I have found the marriage record while in Salt Lake City. 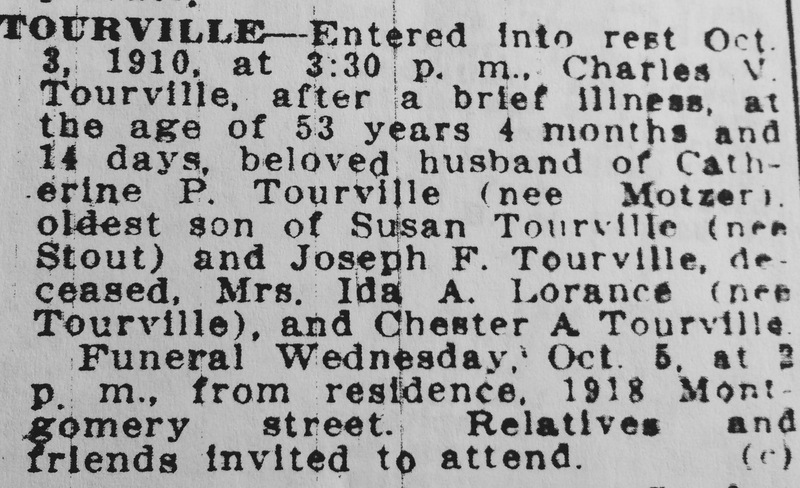 Later on, I noted that Charles was indexed as Toneville. No wonder there was no trace of him in the database before. The only detail that puzzled me is since Amelia died long before 1885, she couldn’t possibly be the mother of Lorena. She also died only four months after her marriage. A quick look at Amelia Meyer and Eugenia Meyer in the 1880 US census for St. Louis and it appears like Charles married his sister-in-law Eugenia after his wife’s death. My next step was the Missouri Death index. I quickly noted the death information for Amelia, on February 4, 1882, Eugenia, on July 30, 1895, and Charles, on October 3, 1910. Robert S. born November 3, 1883, died at age 15 on July 13, 1899. He was badly injured at the Fourth of July celebration and died a week later from tetanus. Lorena E. born September 27, 1885, died in 1964 in California. She was married about 1907 to Robert Gilreath. She was living in Los Angeles in 1910. She is not mentioned in her father’s obituary. Was she estranged from him? Freda C. born November 8, 1887, died on November 20, 1889. Susan (birth name Pearl H.), born July 13, 1892, died on May 17, 1894. Esther born April 15, 1895, died June 22, 1895. So between 1889 and 1899, Charles lost four children and his second wife Eugenia. Esther died one month before her mother. That must have been a very difficult time for the family. As you can see, I now know a lot on Charles B. Tourville even if most of the events happened between the years 1880-1900. Wasn’t I lucky he lived in St. Louis! If not, I might have never known about his other marriages and his children.